Unix for Radiance (by Axel Jacobs) - an introduction to Unix for new Radiance users without Unix command line experience. Mac OSX intro (by Gulio Antonutto and Andy McNeil) - an introduction to Mac OS X for Radiance users who are new to the mac operating system. Unix and Radiance (by Gulio Antonutto and Andy McNeil) - an introduction to Unix for Mac users. Radiance Tutorial (by Axel Jacobs) - A basic tutorial to get started with Radiance. Radiance Primer (by Gulio Antonutto and Andy McNeil) - An overview of Radiance primitives, commands and workflow. Scene 0 Tutorial - A simple room found in section 1.3 of the Introduction chapter of Rendering with Radiance (This chapter is provided free online). Basic rendering tutorial with Radiance (by Dion Moult) - A short tutorial on how to Render an OBJ mesh with Radiance from the command line, with a camera angle calculated from Blender. Radiance Cookbook (by Axel Jacobs) - more advanced modeling and lighting analysis techniques.
. It is found in Chapter 2 of Rendering with Radiance. You'll needto purchase the book for this tutorial. 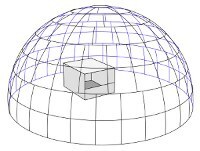 Create 360 VR panoramas with Radiance (by Dion Moult) - describes how to create sphere maps, equirectangular panoramas, and cube maps from Radiance for use in virtual reality. genBSDF Tutorial (by Andy McNeil) - Using genBSDF to create BSDF files for complex fenestrations systems. Photon map user manual (by Roland Schregle) - describes the implementation and use of the forward raytracing photon map in Radiance. 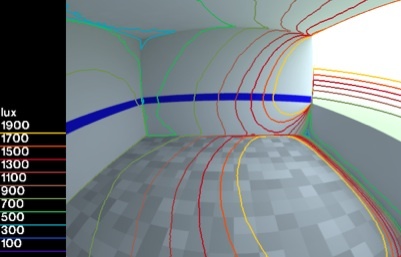 Daylighting Simulations with Radiance using Matrix-based Methods (by Sarith Subramaniam) - The most up-to-date work flows for performing matrix-based daylighting simulations. The zip file to run examples in the tutorial is also provided. rtcontrib lesson (by Axel Jacobs) - Using rtcontrib to compute daylight coefficients for annual daylight simulations. Three-Phase Method Tutorial (by Andy McNeil) - Using rtcontrib and new BSDF capabilities to perform annual daylight simulation for complex fenestration systems (i.e. daylight redirecting and dynamic shading systems). Five-Phase Method Tutorial (by Andy McNeil) - improving accuracy for direct sun in annual simulations with CFS. A bash script to run and time the examples is also provided.